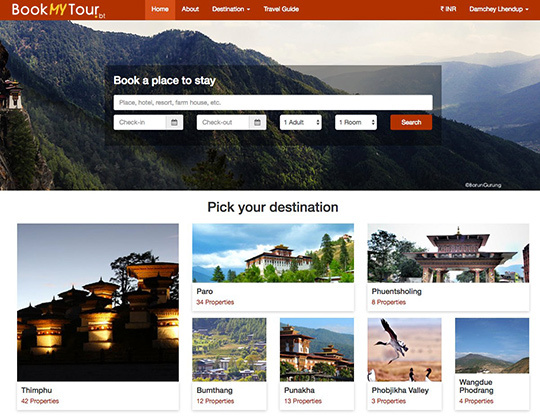 BookMyTour is a new startup in Thimphu providing online booking of hotel rooms in Bhutan. We have developed the entire website (UI, backend, external API integrations, etc) from scratch and was one of the larger projects we worked on. BookMyTour enables tourists and locals to check room availability and book their rooms online through their website. Upon successful payment, the room is instantly booked and reserved for the guest. BookMyTour has partnered with a wide range of Bhutanese accommodation providers from luxury resorts and hotels to small farmhouses. They have also been certified by the Tourism Council of Bhutan as an online travel portal providing room bookings for tourists visiting Bhutan.